»Computer Security»Digital Stalking. Are You Sharing Too Much? Digital Stalking. Are You Sharing Too Much? Think about every social media site that you use. Now think about the information you are sharing on these sites. 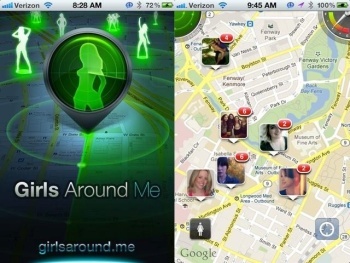 There is a new mobile geo-location app called Girls Around Me. The app makes use of the public information that is shared in Facebook profiles and Foursquare check-in information. Many people use their mobile phones or tablets with Foursquare to check-in to various places to keep up with their friends and know where they are, find out what is nearby, and to learn about various discounts at local bars and restaurants. With GPS enabled smartphones and (or) apps, it is relatively easy to track down where a person is located. Always limit the amount of personally identifiable information you share online. You never know when information from your various social media sites will be combined and making it easy for strangers to know who and where you are. The links below will help you improve your privacy on Facebook and Foursquare. Please click on the Girls Around Me link. I think you should see how this technology is being marketed. That’s messed up. Thanks for the head’s up John!